This bathroom is well organized into three spaces, the lavatory, the shower area and the washbasin. The bathroom is perfectly interworked and the dedicated areas increase the utility of the entire bathroom. The plain white fillings are perfect as per the theme of the bathroom. A washer in the bathroom makes washing of the clothes easier. The shower area of transparent glass looks magnificent and spectacular and is giving a lot of spark to this elegant bathroom. The light at the centre is awesome and beautiful, complementing to the overall look of the bathroom. 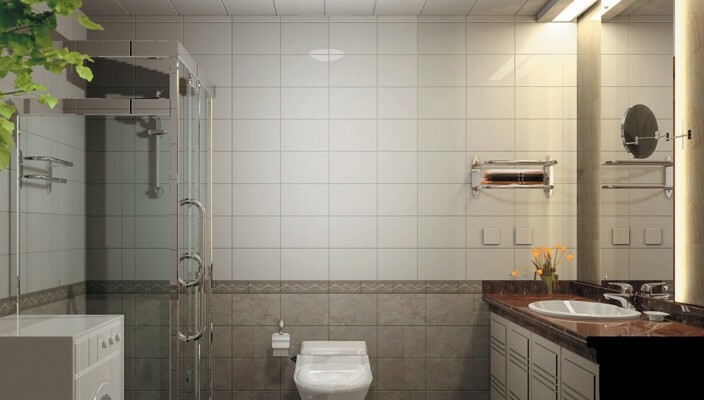 The base tiles are contrasting well with the main tiles of the bathroom. The sanitary wares are well chosen to give a thematic view to the entire design. The platform wash basin is a perfect choice and a sanitary wardrobe below it is a good multi utility piece. By and large this bathroom is wonderfully crafted.